Download here, Windows 10 Update Assistant webpage and Update now. You can read about the major updates that have been rolled into update 1803. This is on the Windows.com blog. 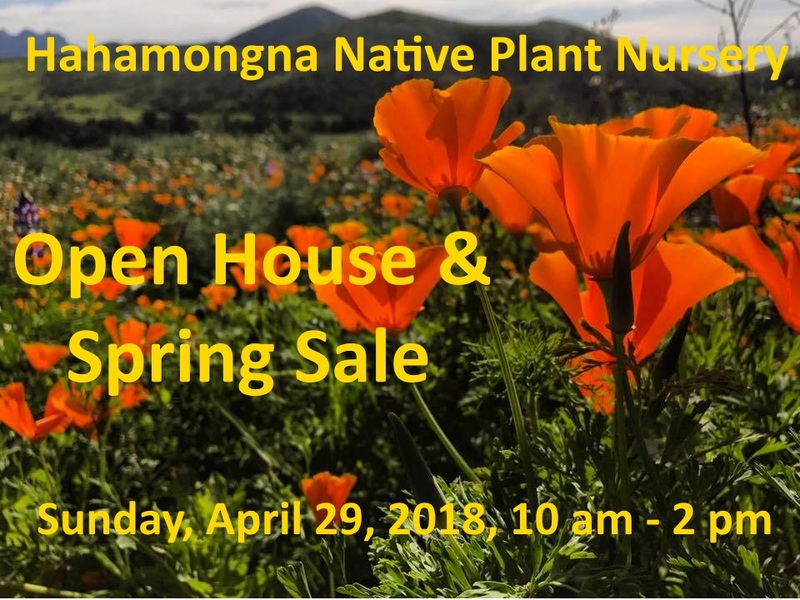 Hahamongna Native Plant Nursery will host an Open House and Spring Sale at its site in Hahamongna Watershed Park on Sunday, April 29 from 10 am to 2 pm. The spectacular wild native plant garden at the nursery at the foot of the San Gabriel Mountains is now blossoming in springtime glory. More than 62 species are flourishing there, demonstrating the beauty and resilience of native plants. Riparian species, invaluable for habitat restoration programs are featured, along with a wide variety of sages, shrubs and trees for more urban landscaping applications. Hahamongna Native Plant Nursery in Pasadena was started three years ago by the Arroyo Seco Foundation to develop appropriate plants and habitat for a stream restoration program in the Arroyo Seco Canyon. Now it also produces plants to beautify local yards and gardens. The plants were recently used to landscape nearby Linda Vista Library as a model for public facilities. At the April 29 event, participants will be treated to a tour of the native plant garden and encouraged to take home a bit of the Arroyo to plant in their yard. The plants will brighten local homes and businesses, save water, provide food and shelter to birds, bugs, and butterflies, and serve as a constant reminder of the natural treasures of the Arroyo Seco. For more information, please call (323) 405-7326. Be one of the first 25 people to check in at the information booth BOTH Saturday and Sunday and get a Grab Bag full of vendor swag!! 3rd Annual Masters of Taste: L.A.’s Top Tastemakers Celebrate the Finer Things On Field of the Iconic Pasadena Rose Bowl! (Los Angeles, CA), Tuesday, April 24th, 2018: Come celebrate and be part of the 3rd Annual Masters of Taste, L.A.’s premier outdoor, luxury food and beverage festival that will take place on Sunday, May 6th, 2018 from 3:00 pm to 7:00 pm on the field of the iconic Pasadena Rose Bowl! Wineries: A specially curated collection of Wine Masters will be showcasing their finest varietals including premium boutique winery Ascension Cellars, Cosentino Winery, Foris Winery & Vineyards, Golden Star Vineyards & Winery, Hitching Post Winery, Y3 by Jax Vineyards, Kieu Hoang Winery, Lorimar Vineyards and Winery, Anderson Valley’s Navarro Vineyards, Roboli Family, Rutherford Ranch Winery, and Wrath Wines. Transportation and Parking: Guests are encouraged to utilize car services – Masters of Taste 2018 Community Partner Lyft is offering (20% off rides to and from the event with this special code MOT2018), Uber, Taxi, etc. – since this event does serve alcoholic beverages. Complimentary parking is also available. 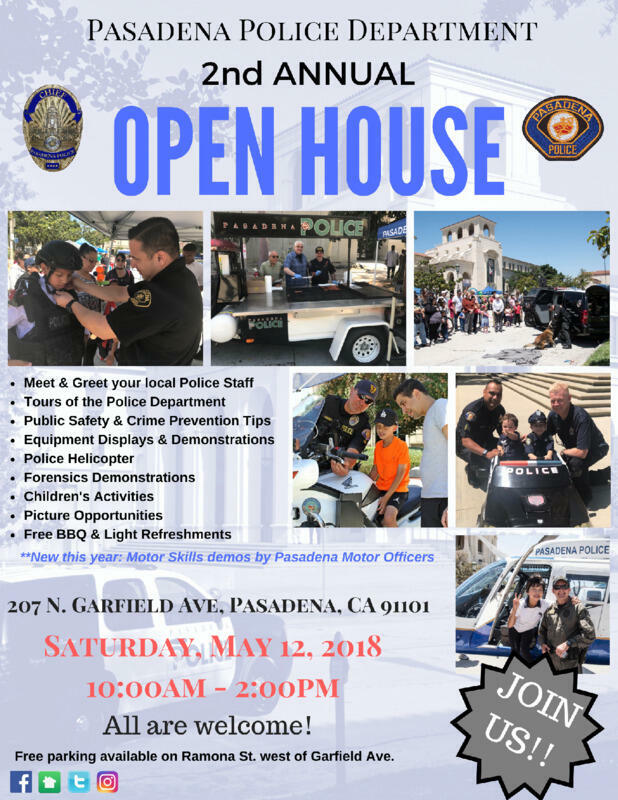 Pasadena Police Department is excited to invite the Pasadena community to the 2nd Annual Open House on Saturday, May 12, 2018 from 10 am to 2 pm at 207 N. Garfield Ave. Come and meet your local Police staff, take a tour of the Police Department, partake in various information booths to include crime prevention tips, employment services, and youth programs, and enjoy live demonstrations from Forensics, K-9 unit, and SWAT. New this year, enjoy Motor Skills demos by award-winning Pasadena PD Motor Officers. Free BBQ and light refreshments will be served. Don’t miss out on this free family event! We hope to see you there! For questions, contact Pasadena PD Community Services (626)744-4551. Blockchain technology is a potentially powerful method for maintaining secure distributed ledgers without relying on a trusted third party. 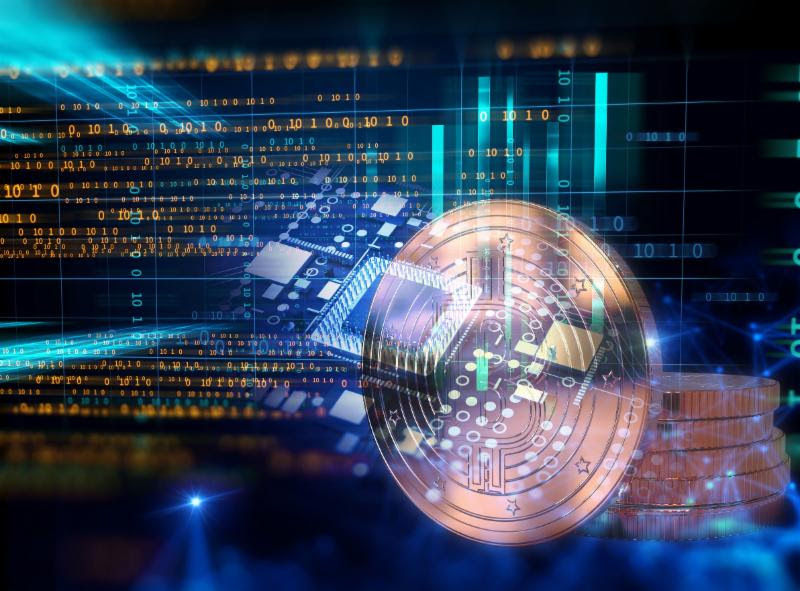 While cryptocurrencies such as Bitcoin have made the headlines and fueled financial speculation, the underlying technology of blockchains shows strong promises for streamlining and securing business processes without providing any direct means of payment. The May 12, 2018 session of the Caltech Entrepreneurs Forum will focus on entrepreneurial opportunities related to those blockchain technologies – ones that do not market or depend on cryptocurrencies. Our program will kick off with a keynote talk by Leonard Adleman, of the University of Southern California. Prof. Adleman has been a pioneer in public key encryption, the co-inventor of the RSA encryption algorithm that is at the heart of many of the systems that help protect secure records and communications. A successful entrepreneur as well as academic, Adleman co-founded RSA Data Security and has insights into what it means to be a business based on encryption technology. A highly interactive panel discussion will follow, delving into the opportunities and challenges of starting a successful business based on distributed encrypted ledgers. The current panel line-up includes a Venture Capitalist, a Supply Chain Management specialist from Accenture and a serial software entrepreneur working in Blockchain. Have questions you’d like to submit in advance? “Submit your question here” on the registration form. are admitted free with ID. charged full price at door. 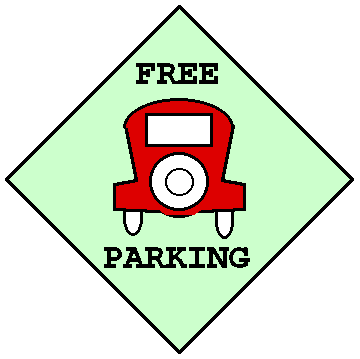 You’ll find plenty of FREE parking on California Street (please obey signs and street markings) and in the underground lot located at the end of the street. Turn Right at signal on east side of Cahill (at tennis courts); follow the signs to the parking lot entrance (appx. 75 yards on right). Join Entrepreneurs Forum Mailing List! According to the official Crack Shack website, a new location is in the works on Green near Raymond to open in the Fall 2018. Century City is slated for Summer 2018. Existing locations in San Diego(Little Italy), Encinitas, and Costa Mesa. Hopefully this location in Pasadena will be dog friendly like the other locations. The Pasadena location was previously occupied by Firehouse Recording Studios and was recently available for lease, the space is approx 6000 sq ft. with beautiful wood beam ceilings and brick walls. Out of our brave culinary Coop comes everybody’s favorite animal that crossed the road, reimagined — Southern California fried chicken and egg fare in the sunny so-cal spirit of inspired cuisine, spacious ambiance, lawn games and craft drinks for any occasion. It’s been 48 years since the first #EarthDay celebrations took place in 1970, come out to share your vision for a more environmentally friendly city & planet and spread awareness about local efforts to #HEALthePLANET and live in a #HEALTHePLANET in 2018! This event is #FREE and open to the public! Public parking is available but we recommend walking, biking or taking Pasadena Transit, Metro Los Angeles Goldine, or Foothill Transit toMemorial Park station to the event. Bus lines 187, 267, 177, 501, 260, 52, 20, 51 stop at Memorial Park. FREE Bike Valet will also also be provided! #MOVE to zumba, yoga, drum circle beats, and live music! stormwater harvesting, water-wise gardening, bike repair, healthy recipe demonstrations, clean energy options, electric vehicle show, art + more! Enjoy #Art, Live #Music, Healthy #Food Trucks & community! If you’re not using SSL—you should be! The web browser community has been pushing for total encryption for the past few years—and the time is here. Google announced that effective July 1, 2018, all web connections without an SSL Certificate will be served up with a “Not Secure” warning. No one who’s building relationships or transacting business online wants their visitors to see that—especially given that a CA Security Council study reports only 2% of already skeptical visitors will proceed past these warnings. SSL Store to help people take care of business before the July 1 deadline. Literally everyone needs SSL and the clock is ticking on Google’s July 1 deadline! More than 70 hyper-focused cybersecurity security specialists and full-service customer support team available 24 hours a day, 7 days a week, 365 days a year. They are solely dedicated to SSL by leveraging award-winning Platinum Partnerships with leading Certificate Authorities (CAs). Always being on the leading edge of industry changes enables The SSL Store to offer affordable, comprehensive solutions. A better option than relying on a single CA, The SSL Store™ is perfectly positioned to leverage its buying power and executive-level partnerships to provide the flexibility, customer-centric approach and custom offerings that others can’t. The Pasadena location of Total Wine is set to open soon.